Union supporters gathered in front of a Boston Fire Department station on Purchase Street on Monday. Unions in Massachusetts aren’t used to losing. But on Monday, they gathered to protest what they believe is an inevitable assault on collective bargaining rights — a fight they almost certainly know they won’t win. 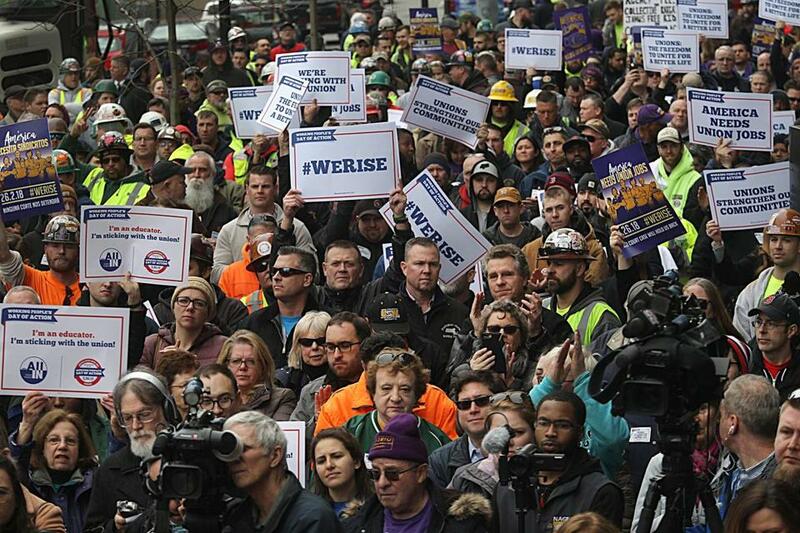 As unions in other states have seen their power sapped by right-to-work laws and curbs on collective bargaining rights, Massachusetts union leaders have said they are bracing for their own crushing blow, to be delivered by the US Supreme Court. A case the court heard Monday will decide whether public sector unions in Massachusetts and 21 other states can charge nonmembers a fee to cover the costs of collective bargaining. If the court, as expected, rules the fees are unconstitutional, unions that represent firefighters, police officers, and teachers will lose a substantial source of revenue. The result could send public-sector unions into a downward spiral, as weakened unions deliver fewer benefits for workers and fewer workers, in turn, see a reason to join unions. Jim Stergios, executive director of the Pioneer Institute, a conservative think tank in Boston, argued the case is about protecting the free-speech rights of workers who don’t want to financially support unions whose work they disagree with. He said he hopes a ruling against the unions will spark the formation of new unions to represent those workers and compete with existing labor groups in the public sector. “There are many people who are going to say to the unions: You need to prove your worth to me,” Stergios said. Under current law, workers cannot be required to join a union and pay membership dues. However, 22 states, including Massachusetts, allow public-sector unions to charge nonmembers a discounted rate, known as an agency fee or a fair-share fee, to cover collective bargaining. The fees are designed to pay for union negotiations over bread-and-butter issues such as pay, benefits, and working conditions, but exclude the cost of the union’s political activities. But the plaintiff in Monday’s Supreme Court case, Mark Janus, a child support specialist in the Illinois Department of Healthcare and Family Services, argues it is impossible to separate the union’s bargaining work from its political activity. He contends that collective bargaining with a government employer is inherently political, on par with lobbying done by groups like the National Rifle Association or Planned Parenthood. Janus argues that requiring him to pay for that activity violates his First Amendment right to free speech and free association. He said he does not want to support his union, AFSCME Council 31, because it backs candidates whom he blames for worsening Illinois’ budget crisis. Unions argue that requiring nonmembers like Janus to pay a fee prevents free-riders from taking advantage of the benefits the union negotiates. The arrangement has been deemed constitutional since a 1977 Supreme Court case, which Janus seeks to overturn. To illustrate the nonpolitical nature of union negotiations, Peter MacKinnon, head of the union that represents Massachusetts’ child protection workers, pointed to his union’s work overhauling the troubled Department of Children and Families. In a legal brief, MacKinnon wrote that the Service Employees International Union Local 509 has joined with Governor Charlie Baker, a Republican, to upgrade technology, improve staffing, and rewrite policies to better protect abused and neglected children. Despite such arguments, unions are bracing for a loss because a nearly identical case in 2016 resulted in a 4-to-4 deadlock, less than a month after the death of Justice Antonin Scalia. Scalia’s replacement, Justice Neal Gorsuch, is expected to break the deadlock and tip the case in Janus’s favor when a ruling is issued by the end of June. In anticipation of the loss, Madeloni said union leaders are working more aggressively to persuade workers of the benefits of union membership. “We’re being galvanized by this in a way that we should have been doing anyway,” she said in an interview after the rally. Daniel DiSalvo, a senior fellow at the conservative Manhattan Institute, said public-sector unions in traditionally union-friendly states like Massachusetts could see a 20 percent drop in membership and revenue if the court invalidates “fair share” fees. He said that is about equivalent to the drop in revenue and membership that public-sector unions in Michigan saw after that state passed a so-called right-to-work law in 2012. While unions could make up for some of the lost revenue by increasing membership dues or more aggressively organizing, “it will take them down a peg or two,” DiSalvo said. Union leaders at the rally described the case as the latest assault on workers’ rights funded by a network of well-heeled conservative donors.